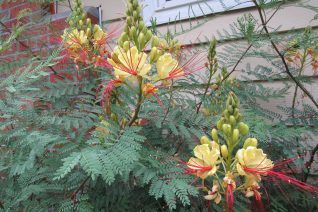 Bird of Paradise shrub is an incredibly showy flowering plant that is surprisingly adaptable to the Willamette Valley. Native to Argentina/ Uruguay the exotic large yellow flowers in whorls each with 3″ strings of blood red stamens protruding. Each flower lasts but a day but a truss carries many individual flowers. Fine divided foliage is light gray green and a great foil for the exotic flowers. Full hot, all day sun in a hot site. Ideally, it should be located against a south facing wall- this heat lover is slow to break dormancy in spring and doesn’t normally begin flowering until mid-summer and continuing until cool weather. To 8′ x 8′ drought adapted but water speeds growth. Deciduous. Spectacular.